Whether you believe that a cherry eye is a cosmetic problem or a serious medical condition, you probably have to agree that it is not the easiest sight to behold. Getting its name from the fact that it seems to resemble a bright red cherry, the correct medical term for this odd looking mass is a prolapse gland of the third eyelid. Unlike people, dogs have a third eyelid or membrane that contains the glands that produce tears. When the tissue that holds these glands weakens, they will pop out so what you see is a small mass which looks like a cherry. Once the gland pop is out and visible, it can become swollen and even become infected. You would think that a cherry eye is painful to the dog, but it usually is not. The main problem that unfolds is the lack of adequate tear production to lubricate the eye, causing the dog to experience a dry eye. However, this is not always the case because as long as the gland is still intact, tear production continues. Cherry eye is common in small dogs, especially young ones. Breeds with short muzzles such as boxers, bulldogs, pugs, and Boston terriers are more prone to developing this condition. But it is also seen in Beagles, Lhasa apso, West Highland Terriers, Cocker Spaniels and as you can see in the picture, English Bull dogs. It can also occur in cats, but with less frequency. This is a picture of my four year old English Bull Dog, “Helda-lot.” She never seemed bothered by that ugly mass. There seems to be some disagreement as to whether it is a problem that needs to be fixed or simply a cosmetic issue causing the dog to have a rather peculiar appearance. There even seems to be controversy over whether the membrane should be removed or just tucked back into place. 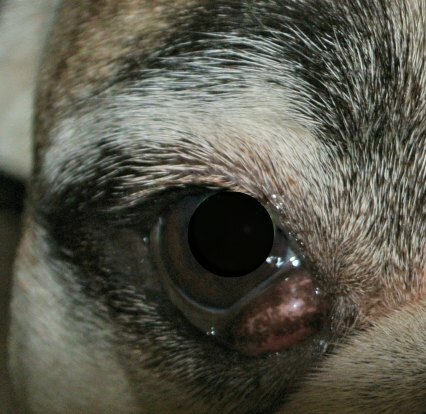 The only symptom is the noticeable circular mass that protrudes from the side of the dog’s eye. It can occur in one or both eyes. Sometimes the mass is accompanied by swelling and irritation. Since the condition seems to follow certain breed lines, it is likely an inherited problem. According to Dr. Karen Becker, the cause isn’t well understood. It is however believed to be weakness of the connective tissue ligaments that holds the glands in place. Since the condition seems to follow certain breed lines, it is likely an inherited problem. The veterinarian will make a diagnosis after observing the mass. Treatment options can fall into two categories: medical and surgical. Of course, the other option is to do nothing. Medical interventions sometimes work if they are begun immediately after the gland pops out. The veterinarian will prescribe eye drops. If medical treatment fails, it’s time for surgery. Veterinarians can either suture the gland back where it belongs or they can remove it entirely. If your veterinarian chooses to remove the gland, the dog may be susceptible to dry eye or Keratoconjunctivitis sicca or KCS for short. This is a chronic degenerative conjunctivitis that does not have a favorable outcome, leading to vision problems and blindness. If this happens the cornea dries out due to inadequate tears. Owners must apply eye drops daily to keep the eye lubricated; otherwise the vision is likely to be affected in the eye. Surgery is done under general anesthesia. 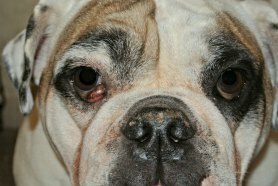 Most of the surgeries to correct Cherry Eye are fast and have very few complications. Most animals go home the same day after they recuperate from anesthesia. After the surgery, some animals are prescribed antibiotic ointment to assist in healing, and prevent infection. Although prolapse can reoccur, it is less common nowadays than it once was. According to Dr. Jennifer Hawkins, from Veterinary Pet Insurance, the average national cost to treat Cherry Eye surgically is $312. Well worth the money to keep your dog’s eye healthy and maintain vision into old age. So, with that all said, must you do anything to treat a cherry eye? Not according to two veterinarians that I have consulted. Of course it is an individual situation and you should consult your dog's doctor before coming to your own conclusions. Back to my sweet "Helda-lot" and her less than gorgeous eye. She just got a clean bill of health by my vet who also suggested that her Cherry Eye was not causing her any issues and unless I didn't like the looks of it, the prolapsed gland could be her forever look. Since she is a brachycephalic breed who might have some issues with the anasthesia, I opted out.